Is there anything more festive than gingerbread?! Ok, cinnamon and cranberries also come to mind but you can’t celebrate Christmas without a little ginger. 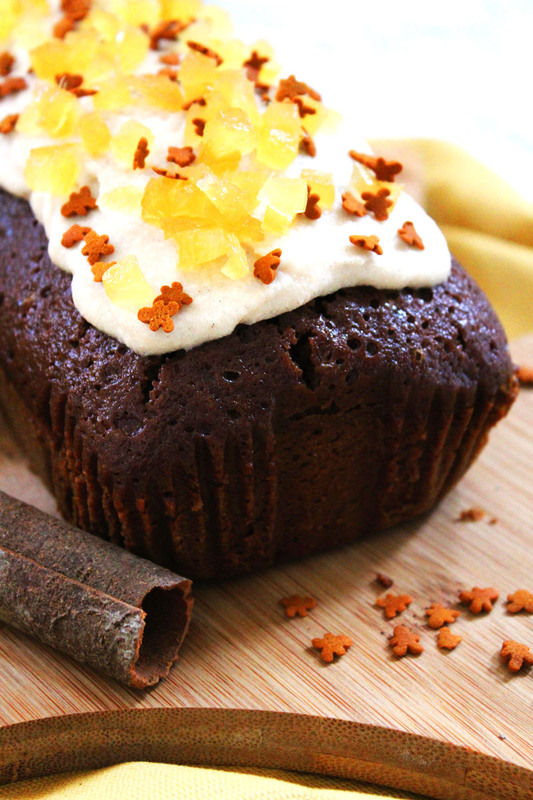 This Gingerbread Loaf is a moist, sticky cake full of festive spices and topped with cream cheese and cinnamon frosting. Scroll down for the recipe. The concept of ‘spare cake’ is a bit alien to me. How could cake ever be surplous to requirements?! there’s no such thing as too much cake right? Well last week was our Christmas Clandestine Cake Club meet up and I’d been in two minds about what to bake. In fact, I was so indecisive I actually baked two cakes! The first was a Cinnamon Loaf which I topped with cream cheese frosting and a mulled cranberry compote. It was delicious, even if I do say so myself, and as it was the first cake out of the oven and decorated in time for the Clandestine Cake Club meeting it was the one I took along. The Gingerbread Loaf however sat naked on my kitchen counter feeling very much forgotten. In fact, it didn’t cross my mind again until I got home later that day. I’d had a long hard week and I couldn’t face decorating, photographing and eating any more cake (I’d had no less than 5 slices at cake club already that morning!) And so it got hidden away in a tin. Luckily, gingerbread tastes best when its had a day or two to mature. It was clearly meant to be! Although this gingerbread loaf looks pretty simple from the outside, there are actually a lot of ingredients that go into it. Beyond the usual butter, flour and eggs there’s golden syrup, treacle, brown sugar, dried spices such as ginger, cinnamon and nutmeg not to mention candied stem ginger and fresh root ginger too! They all come together in a sticky, moist sponge cake that is perfect with a hot chocolate or Christmas coffee. Despite the long list of ingredients it’s very simple to make. You’ll only need a mixing bowl, saucepan and a spatula (minimal washing up is very important at this time of year). You can even keep your loaf tin clean like I did by using loaf tin liners. What I love most about this cake is that it is the perfect alternative to a slice of Christmas cake. I’d be lying if I said it wasn’t rich, but it is still much lighter than your usual slice of fruit cake. The cream cheese icing is sweet, but not as sickly as marzipan and royal icing that usually adorns a Christmas cake. This makes it ideal for a treat while you’re snuggled up on your sofa watching a film or two over the holiday season. Place the water, treacle, golden syrup, sugar and butter into a saucepan and place on a low-medium heat. Warm the mixture gently until the sugar and butter have dissolved and formed a sticky syrup. Finally stir in the stem ginger before pouring the cake mix into the lined loaf tin. Spread the icing over the top of the cake and decorate with diced or thinly sliced pieces of stem ginger (optional). I’m pleased to say the cake went down a treat at work. Who doesn’t appreciate a cheeky slice of cake at 11am on a Monday? It certainly makes the week a little brighter! If you like this recipe, make sure you pin it so you can refer back to it later. Is there a festive cake recipe you prefer to traditional Christmas Cake? Over the last few years I’ve had great fun coming up with alternatives. Keep an eye out for my Cinnamon Loaf Cake with Mulled Cranberry Compote which will be posted later this week, another fab Christmas cake alternative that can be made in a fraction of the time! This looks delicious, I’m not familiar with spare cake either! This gingerbread loaf looks like such a perfect cake. Yum! 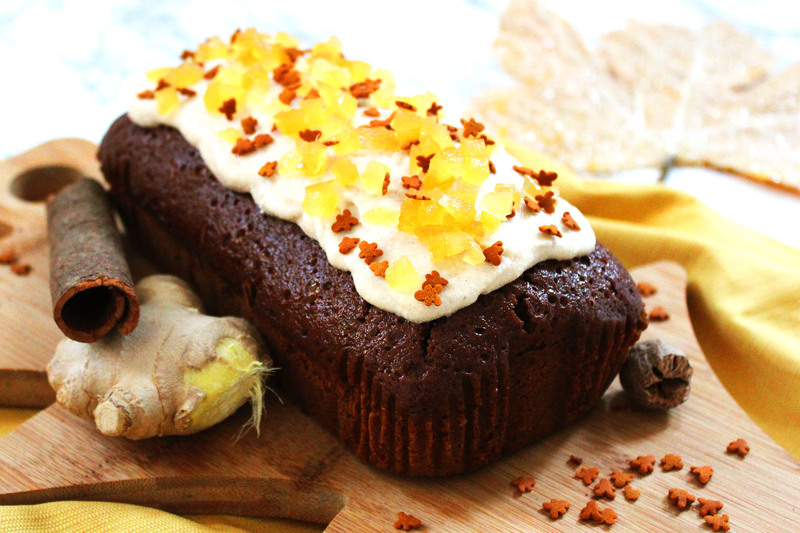 I love ginger cake – in fact, anything with ginger in! I’m rubbish at baking but would like to give this one a go! You can definitely crack this one 😉 I believe in you! Enjoy! 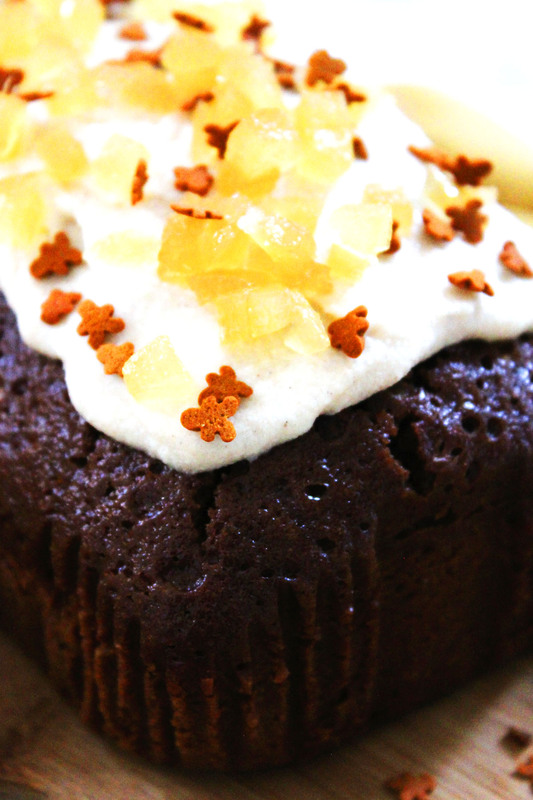 Oh I loooove ginger cake, the stickier the better! And where did you get those teeny tiny gingerbread men? I think ebay or amazon?! Just googled gingerbread sprinkles!!! The beauty of the internet lol!